The latest issue of Weekly Famitsu reveals Dynasty Warriors: Eiketsuden, a strategy RPG entry in Koei Tecmo’s Dynasty Warriors series due out for PlayStation 4, PlayStation 3, and PS Vita in Japan in 2016. Developed by Omega Force, the protagonist of Dynasty Warriors Eiketsuden is Zhao Yun, and players move their units on a grid. It is a simulation RPG through and through, but because it is a Warriors game, players only control one military commander unit. Small-fry opponents will appear in large amounts on the map, and when battles begin, Warriors series-style action scenes will unfold. The protagonist is Zhao Yun, who together with his friend Lei Bin, uncovers a mysterious girl named Li Xia sleeping in the pillars of ice within a shrine. Zhao Yun (voiced by Masaya Onosaka) – The protagonist. He shows remarkable activity and is awarded a special power from Li Xia. Lei Bin (voiced by Makoto Furukawa) – A scholarly young man who is Zhao Yun’s childhood friend. Li Xia (voiced by Minami Tsuda) – A mysterious girl sealed away within a shrine. Other military commanders confirmed to appear include Cao Cao, Xiahou Dun, Jia Xu, Sun Jian, Zhang Fei, Liu Bei, Guan Yu, Lu Bu, Diaochan, Dong Zhuo, and Yuan Shao. At its core, it is a grid-based strategy RPG, but since it’s a Warriors series title, you’ll have a single military commander unit as well, and there will be tons of small fry to destroy. During battles, it switches to action scenes, and while you don’t control the action, Warriors-style action scenes will seemingly unfold. Development began last year when Omega Force decided it wanted to take on a new genre. Action games and strategy RPGs truly are two different things. I had a different time trying to convince the company, but presented a desire to create a rich story with a deep setting. Since it’s a strategy RPG, its necessary computations are reduced, and we can have more soldiers to make for a more powerful battle production. It uses Romance of the Three Kingdoms as its base and adds fantasy elements. In order to avoid the childhood friend love story, we’re introducing Lei Bin as Zhao Yun’s childhood friend. Li Xia is a character who doesn’t know anything and came from another world, while Lei Bin is there to explain things and provide commentary. Since this is a series with many popular woman characters, we had a difficult time with her design. 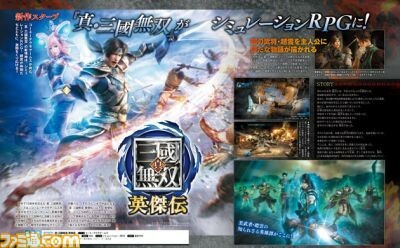 Since Zhao Yun is the protagonist, it will focus on Shu Han military commanders, and military commanders who have yet to appear will also make their debut. Because it’s a Dynasty Warriors game, it would be nice if we could include Jin Dynasty military commanders, but putting everyone is difficult. There will be special conversation events and friendship-becomings among the game’s appearing military commanders. The system is an orthodox strategy RPG, there’s a world map you travel on, battles and free battles, and is assumingly turn-based. Facing characters in certain directions and zone of control will be in the game. Weapons will have a range of distance, actions use a cost system, and EX Attacks can also be aquired. Characters will grow according to a skill system. As Omega Force’s first strategy RPG, we’re taking on various challenges. Development is 70 percent complete.